Majority of them are fresh water. They are also found on moist soil. They form dark green mats. 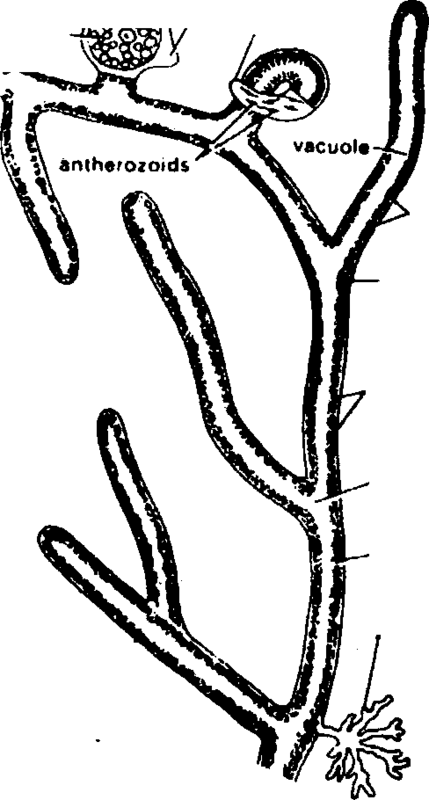 The thallus is filamentous. The filament is cylindrical, branched, tubvlar, erect coenocytic. The filament is attached to the substratum by hepteron. Hepteron is colourless branched rhizoid like structure. Fila nent increases in length by apical growth. Cross walls are absent. The cell wall is thin. It consists of inner layer of cellulose and an outer layer of pectic substances. The filaments are coenocytie. Septa is absent between the cells. Septum is present only at the base of reproductive structure. The cell has peripheral layer of cytoplasm. Ilk cytoplasm surrounds a large central vacuole. Vacuole is filled with cell sap. Many small nuclei are embedded in the cytoplasm. Cytoplasm also contains small discoidal chloroplast. Chloroplasts are small, oval, circular or elliptical. The pigments are chlorophyll a, chlorophyll e, beta-carotene and xanthophylls. Nanthophylls are dominant pigment. Its gives the thallus yellow-green colour. Pyrepoids are absent. The reserve food material is oil drops. Starch is absenttlahseeatarainultinucleate due to absence of septa. 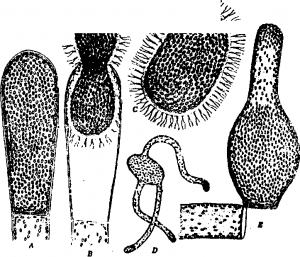 Fig: A -Zoo sporangium, B-Liberation of zoospore, C-Zoospore. h is not a common mode of reproduction. 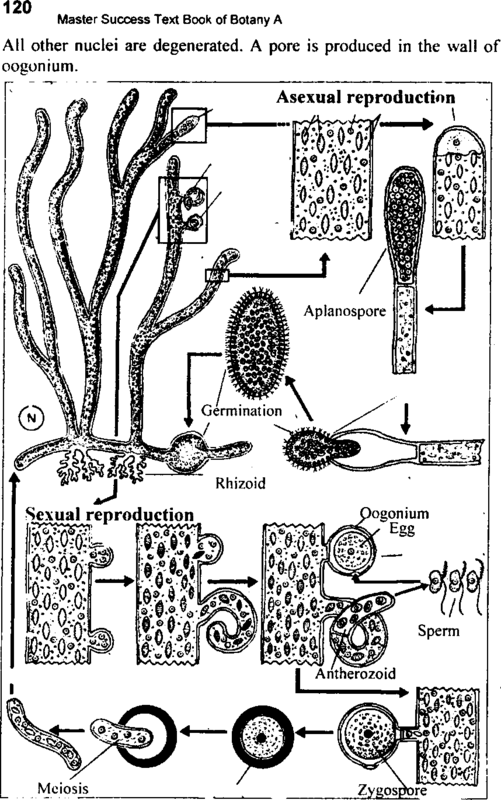 Vegetative reproduction takes place by fragmentation. The filaments are broken accidentally into fragments. Each fragment develops into new plant. 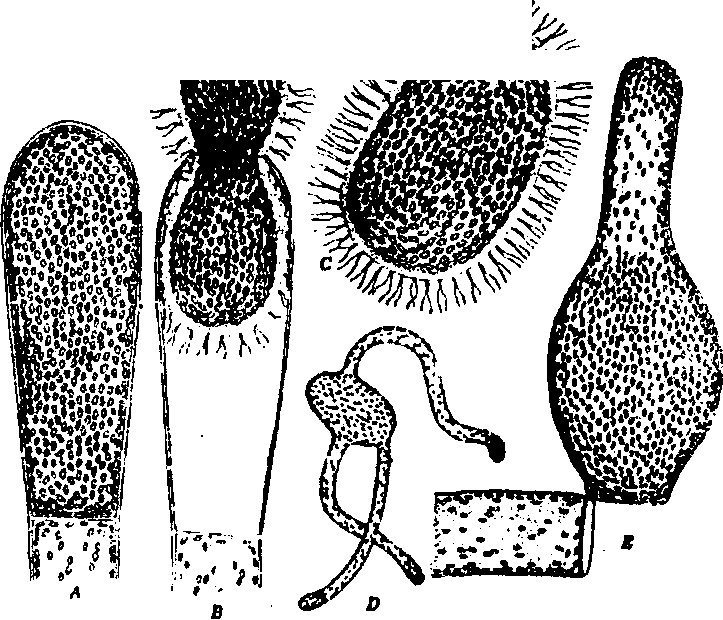 Loospores: Zoospores are produced in sporangia. The tip of the filament enlarges. A septum separates the tip from the filament. The protoplast of sporangium contracts. It is changed into single multinucleate zoospore. Many flagella develop on the surface of zoospore. Two flagella are present opposite to each nucleus. The centre of zoospore is occupied by a vacuole. The zoospore comes out through a pore. It then settles on the surface and undergoes a period of rest. Then zoospore lost flagella. Nov, zoospore secretes a thick wall around it. It germinates and form two or more germ tubes. These tubes grow to form new filaments. One of the tube acts as hepteron. (a)Direct development: In this case, aplanospore germinate to form new plant directly. conditions or in low temperature. Sometimes, thin wall divides the contents of aplanospore in to many parts. Each part develops cysts or hypnospores. This stage of Vaucheria is called Gongrosira stage as it resembles the alga Gongrosira. The cyst ruptures in favourable conditions and protoplast comes out by amoeboid movement. This protoplast become spherical and secretes new wall. It germinates to form new filament. 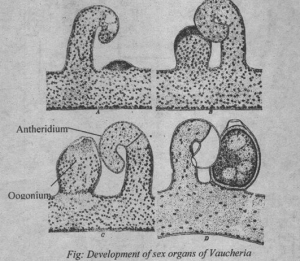 VauTheria has advanced type of sexual reproduction. It is oogamous. Vaucheria is homothallic. 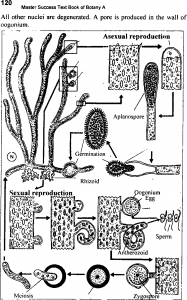 The male reproductive organ is antheridia and female reproductive organ is 00gonia. The oogonia are larger in size. It may be sessile or stalked. It is produced on special reproductive branches. Mature antheridium is stalked. It is cylindrical, tubular and hook shaped. The development of Oogonium starts before the development of oogonim. The antheridium is club shaped. It is produced in the apex of short branches. A septum separates it from remaining filament. Antheridium forms a hook. The protoplast of antheridium is divided into many uninucleate parts. Each pan develops two lateral flagella and becomes antherozoid. The flagella are unequal in size. They are laterally inserted and pointed in opposite directions. An apical pore is developed at the tip of antheridium. Oogonia are produced near antheridia on the same filament. 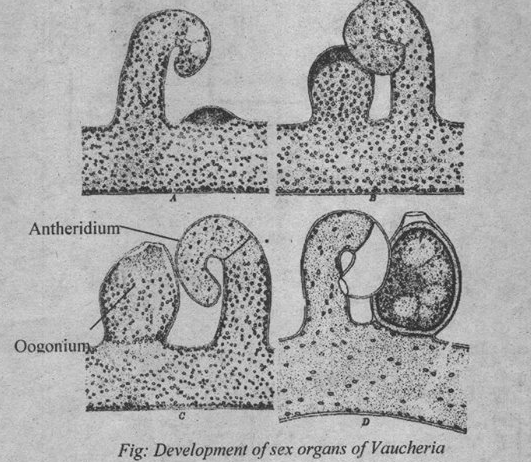 The devclopment of oogonium starts after the development of antheridium. Ooganium is produced from short lateral branch. These branches are present near the antheridium. A bulge is produce in the filament. A large mass of cytoplasm with many nuclei and chloroplast move into it. A septum cut off it from main branch. The oogonium swells and becomes globose. The multinucleate protoplast of oogonium is changed into single egg or oosphere. Only one nucleus is left in it. All other nuclei are degenerated. A pore is produced in the wall of oogonium. Many antherozoids enter into oogonium through its pore. But only one fuses with the oosphere. The size of male nucleus increases before fusion. The zygote secretes thick wall and it becomes oospore. The oospore undergoes a period of rest. It passes unfa iourable conditions. The oospore germinates and produce new filament directly. First division is meiotic. Thus haploid number is restored. Not excellent but it can be used …….